There is no escaping politics in America today. The polarizing nature of the two-party system has reached its zenith, creating a government that finds it difficult to get anything done. It’s a civic duty to know what is going on with the government, but in today’s volatile environment, it’s almost impossible to fully grasp all of the machinations pulling and pushing legislation that could severely impact life in the United States. Paying attention is easier thanks to social media, but understanding is more difficult because so many different sides are presented on every issue. So some people try to look away, try to avoid the conflict. But because politics anchors almost all newscasts and print publications, it is challenging to avoid political and governmental updates. The effect of government action on investing has also developed a new and ardent following. Thanks to new tax laws and President Donald Trump’s active pursuit of changes in tariffs on imported goods, investors and advisors are consistently watchful of updates that could impact investing decisions. With all of that in mind, Spectrem’s new study asked investors to detail just how much more they pay attention to politics today than in the past. Politics, Taxes and Investors’ Changing Attitudes examines all of the hot topics surrounding government action and its impact on the stock market and other investments. The impact of the busy American political landscape will affect advisors as well as investors, because those investors are more likely to want to discuss their portfolios and investment decisions on a regular basis thanks to the constant whirlwind of activity coming out of government offices. 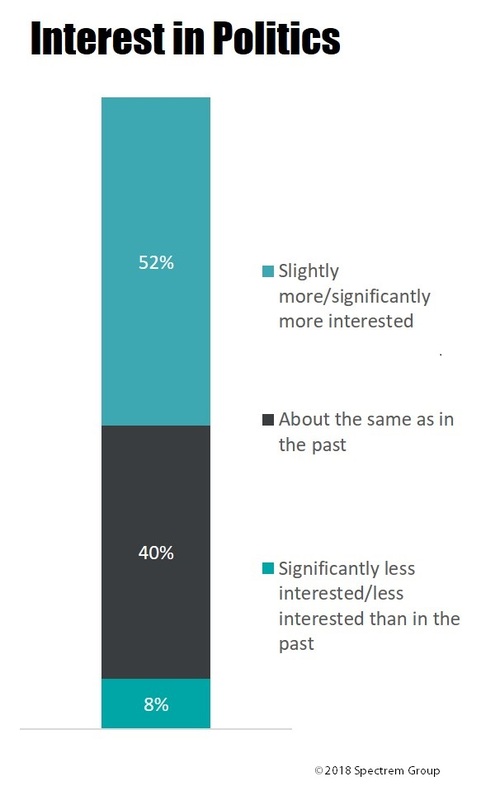 In the Spectrem study, investors were asked “Are you more or less interested in politics than in the past?" Fifty-two percent said they are more interested, and among that group, 28 percent said they are significantly more interested. Compare that to the 8 percent of investors who claim to be less interested in political matters than in the past, and you see that politics has moved from an occasional topic of discussion to one that dominates the “water cooler" scene. Asked to explain why they are more interested in politics today, 47 percent said they were interested in seeing what the Trump administration and Congress were up to. However, there was approximately 30 percent of those investors paying more attention who say they can’t avoid politics. Also, an equal percentage (just under 30 percent) say they support the administration and want it to be successful, or say they dislike the current administration and pay attention to politics in hope it fails to enact the programs and legislation it proposes. The balance of those in favor of the Trump administration and Republican-led Congress and those opposed are part of what makes the political arena so addictive today. There are several personal questions advisors should avoid asking investors, and political leanings might be one of those. However, considering the black-and-white nature of most political discourse today, it is probably fairly easy to determine which side of the coin an investor prefers. How an investor feels about governmental programs such as tax reform, globalization versus nationalism, and immigration reform could have a major impact on the direction investors want their investments to take. Advisors need to be fully aware of the political arguments taking place in the country, and be prepared to interact with investors differently based on how they feel regarding those political topics.